Katja it’s up and go to training while I skip it to spare the leg. I roll over, fall asleep again and don’t wake until 9:30. Damn, twelve hours of sleep is just great! I drive over to pick up Katja and to say goodbye to Rich. It’s been great having him as a sparring partner, and we’re looking forward to seeing him whenever we’re in New York or he chooses to come to Oslo. 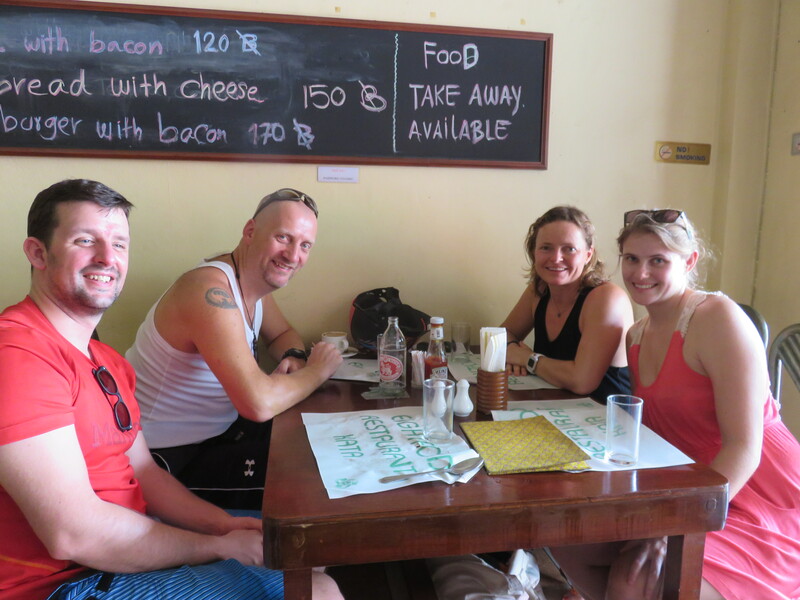 We don’t do lunch at Tiger since we’re lucky enough to have a Norwegian friend vacationing here in Phuket. Lene, one of our Karate friend has been working for CERN in the particle accelerator thingy they have there for several years. The last two years in parallel with doing her Ph.D. on the data mining/analysis she’s doing. She just handed in her paper and have a well earned vacation with her boyfriend Christoph. We drive to Kata beach and meet them in a restaurant there. It’s great seeing Lene again. Think that the cute little girl we got to know in the Karate club is now a doctorate. Amazing. I’m really proud of her achievements. Her boyfriend Christoph is a very nice guy and the four of us have a nice time together with lunch, and then some time at the beach. We ride home to see if we can get a massage, but Katja’s belly is acting up. Laying face down and get stepped on by a Thai masseuse is not on today’s to-do list. So we end up with a light dinner at Tiger before watching some tv. “Hola better internet”! I’ve mentioned it before, but it rocks so hard it deserves to be mentioned again. A plugin to Chrome on the pc gives us access to Netflix from Norway. We can therefore save our local media and enjoy HD stream of video. Love it. Categories: Thailand | Tags: BJJ, Martial Arts, Motorbike, Muay Thai, Thailand | Permalink.